Persistence Market Research in its report titled “Mechanical Mine Clearance System Market: Global Industry Analysis and Forecast, 2016–2024” offers detailed insights and in-depth research on the global mechanical mine clearance system market over an eight year forecast period 2016 – 2024. The report covers the important factors driving the growth of the global mechanical mine clearance system market, untapped opportunities for manufacturers, trends and developments shaping the dynamics of the global mechanical mine clearance system market and other insights across various key segments. The report identifies the drivers and restraints affecting the growth of the global mechanical mine clearance system market. Changing trends are also analyzed and incorporated in the report to equip the client with exhaustive information about the market resulting in better decision making. Macroeconomic factors that directly and indirectly affect the growth of the global mechanical mine clearance system market are also incorporated in the report. The market value for all segments is taken in US$ Mn and the market volume is also identified in units for all the segments. A section of the report highlights region wise mechanical mine clearance system demand. It provides a market outlook for 2016–2024 and sets the forecast within the context of the global mechanical mine clearance system market, including the new technological developments as well as product offerings for niche applications in the global mechanical mine clearance system market. In the final section of the report, a competitive landscape has been included to provide report audiences with a dashboard view. The report provides a detailed market share analysis of the global mechanical mine clearance system market on the basis of key manufacturers. Detailed profiles of manufacturers are also included within the scope of the report to evaluate their business strategies, key offerings and recent developments in the global mechanical mine clearance system market. Market volume is inferred through in-depth secondary research and validated from industry experts through primary interviews. Each interview is thoroughly analyzed and average market volume is deduced and reconfirmed prior to incorporating in the report. The price of mechanical mine clearance system is deduced basis the product type, where the average price of each mechanical mine clearance system type is inferred across all the five assessed regions. The market value of the global mechanical mine clearance system market is thus calculated from the data inferred from the average selling price and market volume. For a comprehensive forecast of the global mechanical mine clearance system market, various macroeconomic factors and changing trends have been observed, giving an idea about the future of the market. Other important factors considered to arrive at market forecast include the size of the current market, inputs from the supply side and the demand side and other dynamics shaping the scenario of the global mechanical mine clearance system market. In the compilation of the report, the forecasts are conducted in terms of CAGR, while other important criteria such as year-on-year growth and absolute dollar opportunity have also been incorporated presenting the client with in-depth insights and future opportunities likely to emerge in the global mechanical mine clearance system market. Mechanical demining is known as the method of removing land mines with effective use of mechanical equipment. This process is faster and safer as compared to manual demining. The main problem for carrying out this operation globally is the cost of such specialized devices in the market. This plays a very significant role in the global demining market. Demining activities can be broadly classified into humanitarian and military demining. The mechanical mine clearance system is used in both humanitarian as well as military demining activities across the globe. By product type, the Mine Flail, Mine Tiller and Combined Machine (Flail or Tiller or Plough) are covered in the scope of the research, similarly by operation, manual operation and remote control operation/robotic vehicles are considered within the scope of the research. The global mechanical mine clearance system market was estimated to be valued at nearly US$ 40 Mn by 2016 end and is expected to reach nearly US$ 52 Mn by the end of 2024, registering a CAGR of 3.9% over the forecast period. The global mechanical mine clearance system market is anticipated to represent incremental opportunity of more than US$ 12 Mn between 2016 and 2024. In terms of volume, the global mechanical mine clearance system market was estimated to reach 55 units by 2016 end and is anticipated to increase to 71 units by 2024, exhibiting a CAGR of 3.1% over the forecast period. One of the positive aspects of demining the world is that it has garnered interest from many non-profit organizations such as the United Nations, GICHD: Geneva International Centre for Humanitarian Demining, and several other peacekeeping organizations in the world. Reporting to the security threat that planted active landmines pose, NGOs, international donors and several private companies have established a new help sector called the “Mine Action”, justifying the influence of landmines and UXO (Unexploded Ordnance) through stockpile destruction, political advocacy clearance, education, and survivor assistance. Since the signing of the anti-personnel Mine Ban Treaty in 1997, administrations have spent over US$ 3 billion on mine action as of 2010, which is now deliberated as a foremost constituent of international post-conflict reconstruction efforts, contributing to the creation of a secure environment, opening access to roads for commerce and aid, rehabilitating agricultural land, providing employment for demobilized soldiers and assisting in refugee return for various mine affected regions and countries. The mine flail segment was estimated to be valued at more than US$ 20 Mn by 2016 end and is expected to dominate the global mechanical mine clearance system market, registering a CAGR of 3.9% over the forecast period of 2016–2024. 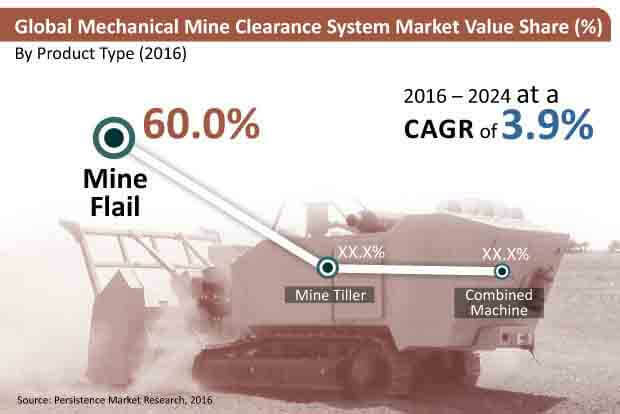 The combined machine segment was estimated to grow in the global mechanical mine clearance system market with a 19.6% market value share, valued at nearly US$ 9 Mn by 2016 end; exhibiting a CAGR of 4.5% over the forecast period 2016–2024. The combined machine segment in the global mechanical mine clearance system market is projected to grow at a consistent rate due to the multifunctional operations performed by the vehicle. The Europe mechanical mine clearance system market accounted for a value share of 41.4% in 2015 and is projected to retain its dominance in the global mechanical mine clearance system market over the forecast period. The MEA mechanical mine clearance system market is expected to represent significantly high incremental opportunity between 2016 and 2024, while the Europe mechanical mine clearance system market is projected to expand at a significant CAGR in terms of volume over the forecast period. Sales of mechanical mine clearance systems in Japan is expected to represent a total incremental opportunity of nearly US$ 15 Mn between 2016 and 2024.